Regarding flights to Samui, Bangkok Air has momentarily the sole and exclusive rights to fly to Koh Samui although Thai Airways offers now two flights per day between Bangkok and Koh Samui. Note that the first and the last flight of the day have special rates, almost 50% cheaper than the standard rate. If you sign up for their Flyer Bonus program, you receive an additional 10kg luggage allowance, among other benefits. Signing up for their Flyer Bonus program can be done by clicking on this link. Bangkok Air operates direct flights between Samui and; Bangkok - Suvarnabhumi Airport, Chiang Mai (change over in BKK), Krabi, Pattaya, Phuket, Sukhothai (via BKK) and Trat. Thai Air has two direct daily flights between Bangkok and Koh Samui. Direct international destinations from Samui with Bangkok Air are Singapore and Hong Kong on a daily base. Furthermore also Firefly and Berjaya-Air fly between Kuala Lumpur, Langkawi and Koh Samui. Other options are to fly from from/to Bangkok with cheap cost carriers to/from Surat Thani airport with Air Asia and take a bus trip to/from Don Sak or Surat airport or you can fly to/from Nakhon Si Thammarat with Nok Air which involves a high speed catamaran between Samui and Don Sak and buses between Don Sak and Nakhon's airport. The latter two options are cheaper than flying with Bangkok Air but are more time intensive and are limited to one or two flights per day. Under this link you can find the arrival information for Samui airport, check this link before you go to the airport for picking up people or before you depart to see if there are any delays on any in- or outbound flights. From/to Bangkok; Overnight VIP Sleeper Air con Bus depart from the Southern Bus Terminal around 1900, arriving in Surat Thani around 0700 where there is a bus shuttle and ferry link service to Samui or alternatively you van go by private charter companies/travel agencies at Kao San Road in Bangkok with a direct connection onto Samui by ferry. 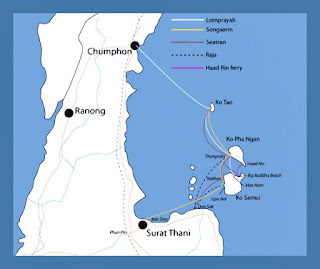 Other direct bus connections from Koh Samui are to/from Hat Yai, Phuket and Surat Thani town. Various mini buses go to plenty of other destinations on a daily base from Koh Samui, check with local Samui travel agents for time schedules and prices. Overnight sleeper from Bangkok Hualampong Station departing between 1800-1900 arriving at Surat Thani Railway station 0600 where there is a bus shuttle and ferry link service to Samui. For reservations use the State Railway of Thailand website. From Koh Samui you can also take a ferry link and bus shuttle to the Surat Thani train station and take a train to the Malaysian border. If you travel by car, either rental car or your own, the main ferry port on the mainland to Samui is Don Sak where two companies run hourly car ferries that also take walk on passengers. Between Don Sak and Nathon, the Seatran company runs the ferries that I recommend, here's the schedule. The other company is the Raja Ferry company, which operates older and in my opinion less well maintained vessels between Don Sak and Lipa Noi, near Nathon. There's currently no website available for them but they run ferries between 6am and 6pm each day, weather permitting. New ferry service for walk on passengers only is Lomprayah and an operator who's been in service for a long time is the Songserm expressboat.